It is not only about the powerful functions and features that our best free dashboard templates come with, design matters, too. After investing a good chunk of time into picking only the top and most promising tools, here we are now, saving you time and money. Amongst all the products you find below, there are those with exclusive features and others which are as versatile as possible. That said, you surely will find the right option for your website or application. There is no need to build from the ground up anymore. You can take a way simpler and efficient path by choosing what is already available. To track the performance of your website, these best free dashboard templates come extremely helpful. You simply integrate the one you are after into your project and have a better understanding how it performs. To grow your business, it is crucial to track pretty much everything. 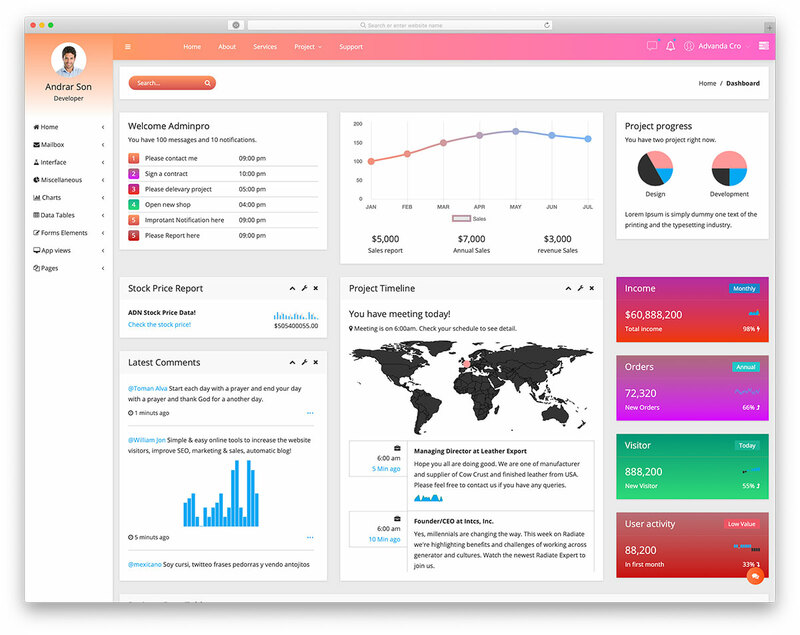 With a dashboard template, you will know exactly how well your online project is doing. 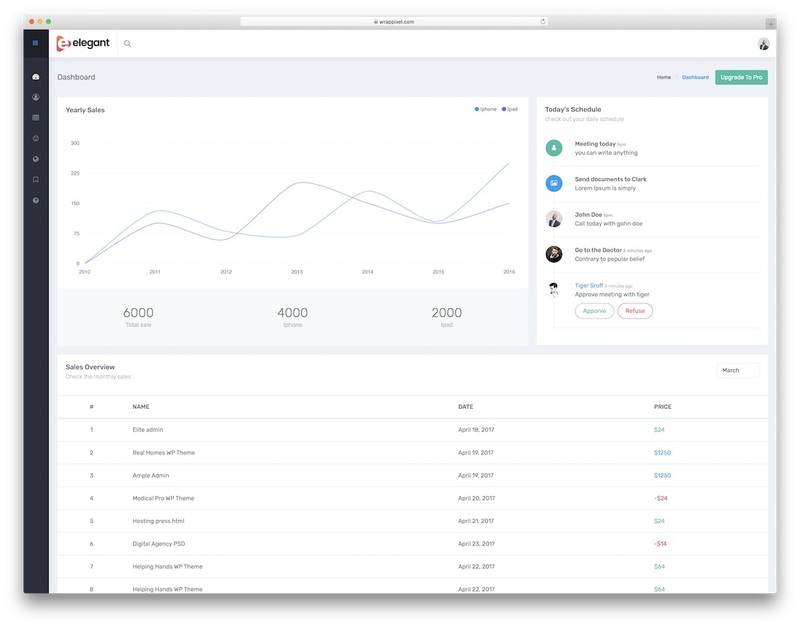 For instance, track sales, new members, likes, profits, tickets, you name it, it can all be done inside your ultimate dashboard. Site management becomes a lot more unchallenging when you have it all clearly gathered in one place. Make the most out of it and run your online project of any kind like a pro. While free dashboard templates have certain limitations, we already published an outstanding collection of HTML admin templates if you are ready to go premium straight away. 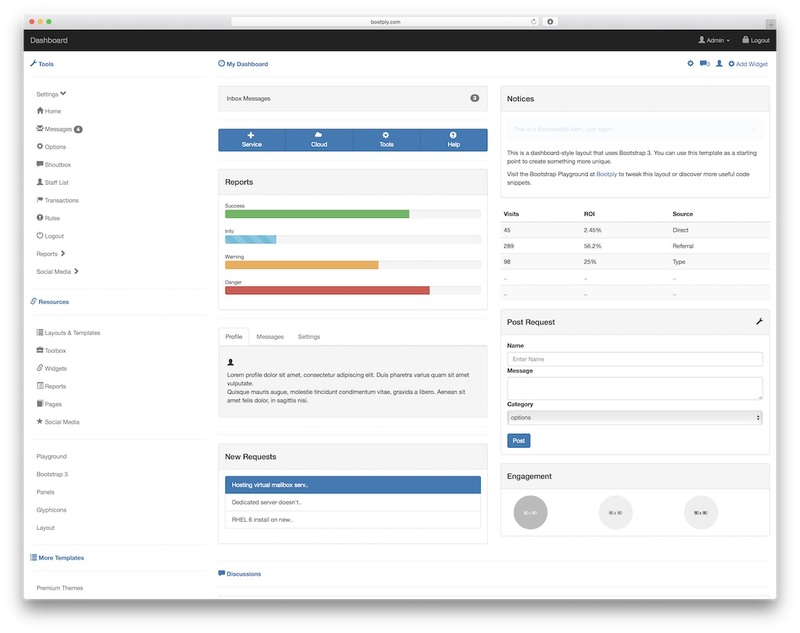 You can even pick a Bootstrap admin template and bring site control to a whole new level. But that is something you will going to do with the products you find further down the page. Let’s get down to business and see what we have in store for you. 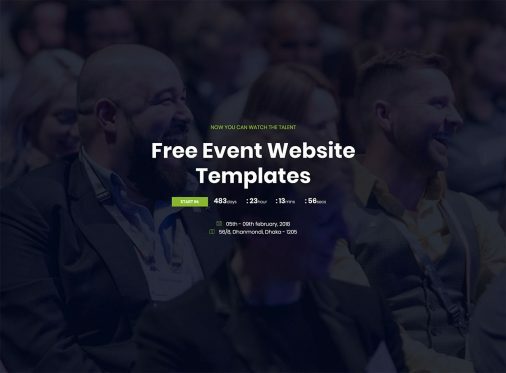 Before you download the one you believe suits you best, check the live preview and see the free dashboard template in action. Metronic is the most popular premium admin templates ever released. 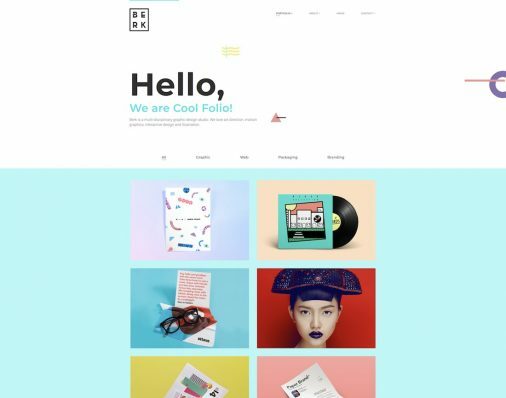 It comes with many design & layout variations and works as HTML template as well as Angular template. If Adminator and Terminator have something in common, I cannot tell you, however, the former sure is a powerful tool for building top-notch dashboards. 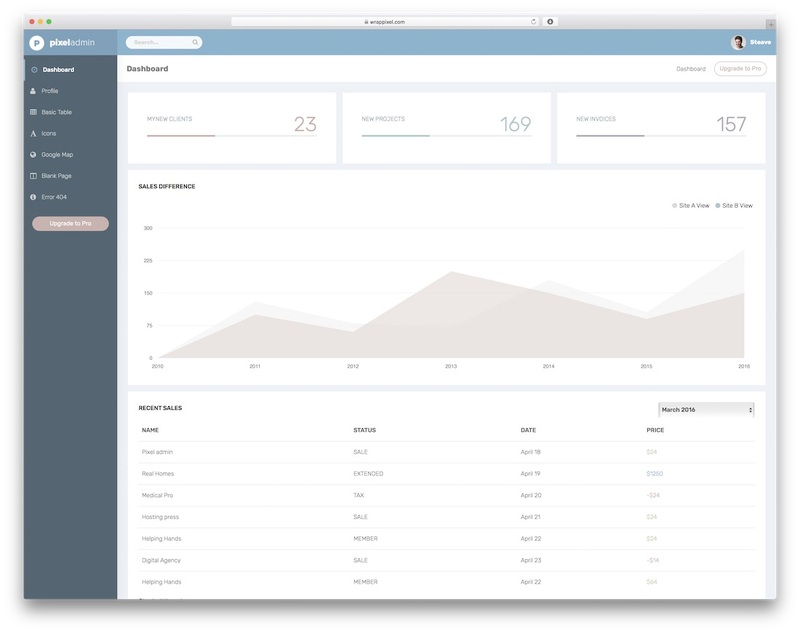 It is a free Bootstrap 4 admin template which makes building dashboards oh so much fun. Adminator has plenty ready-to-use features which you can take to your advantage and build the exact administrator you are after. Instead of coming up with your own version, the majority of work is already completed for you. Just make sure you follow the simple installation process and you are ready to go. From custom pages, practical widgets, maps, tables and UI elements, Adminator has it all and then some. You can do pretty much whatever you want with the template. Customize it, copy it, even seel it, for as long as you have it clearly stated that Colorlib is the author. Other than that, throw it into the modification blender and make it as unique as you want. Admindek is, no doubt, a sophisticated free dashboard template for all sorts of websites and applications. Whatever you plan to start, you can always be safe with the complete overview of your project using a solid admin panel. Admindek is here to sort that part of your business out in its entirety. It comes with a bunch of different layout styles which you can choose from and all sorts of pages and widgets. Admindek brings to the table a vertical, horizontal and bottom menu navigation and even provides a variety of other styles. You never run out of options when it comes to Admindek. It is a tool packed with goodies and assets that you can take to your advantage without the need of spending a single penny. And there are no other hidden fees! Just download Admindek and start putting it to use right off the bat. 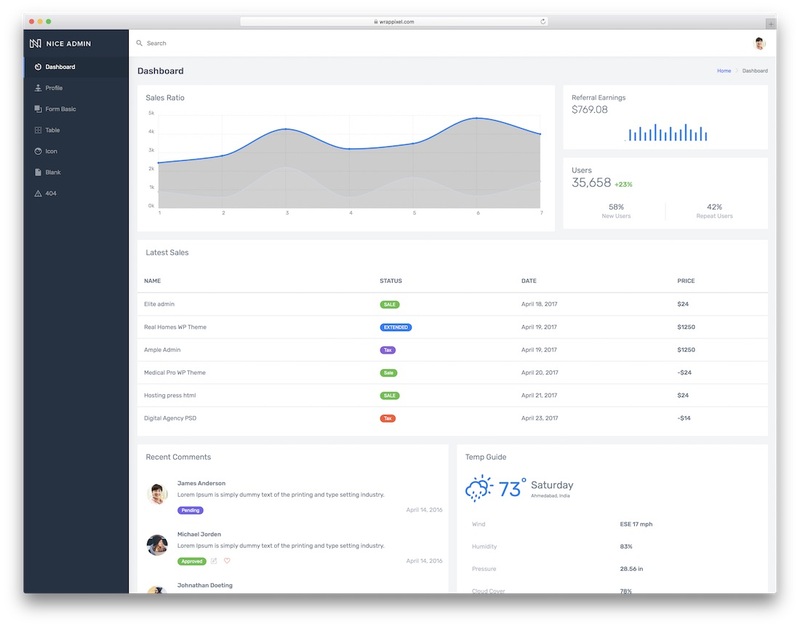 Adminty is a neat, tidy and modern free dashboard template which you can utilize for your project effortlessly. There are three options you can go with; default, CRM and analytics. Moreover, Adminty also has different page layouts, like vertical, horizontal, bottom menu and boxed style. In addition, if an RTL admin is what you are looking for, Adminty has an entire layout dedicated to right-to-left languages, too. See it in the live preview yourself first before you put it to use. A ton of widgets, many UI elements, forms and tables await every Adminty user. Use and reuse the content, adjust and tweak the predefined content and get creative. Adminty is here to serve your needs and requirements for a successful operation of your online presence. And it will take you very little work to get things moving since all is presented to you on a plate. 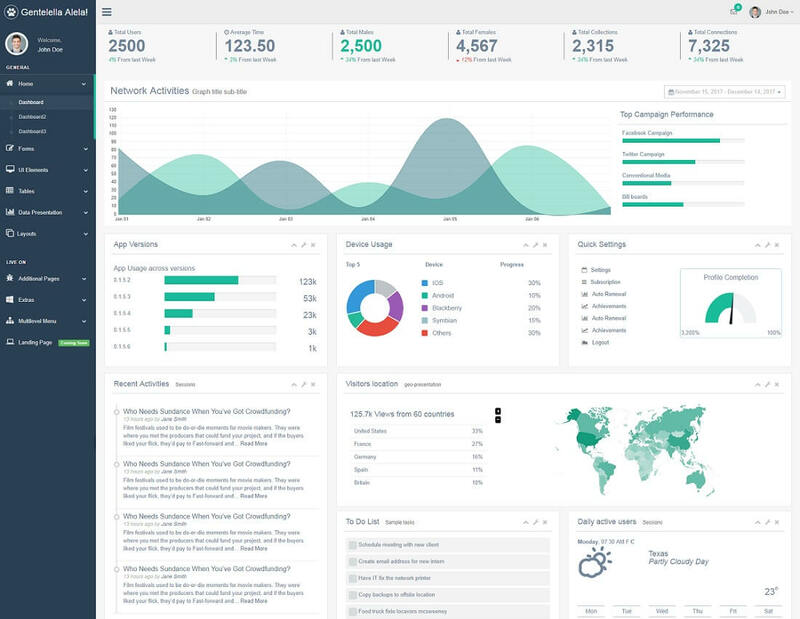 For your app, services or websites, Gentelella is the great free admin dashboard template which is based on Bootstrap 3. All this means is that the product is flexible and entirely mobile friendly. Something you should not be missing no matter what type of online project you plan to launch. In the mobile-first era we are living, it should all be responsive and perfectly adapting to smartphones and tablets. Gentelella sure does not have an issue with that. 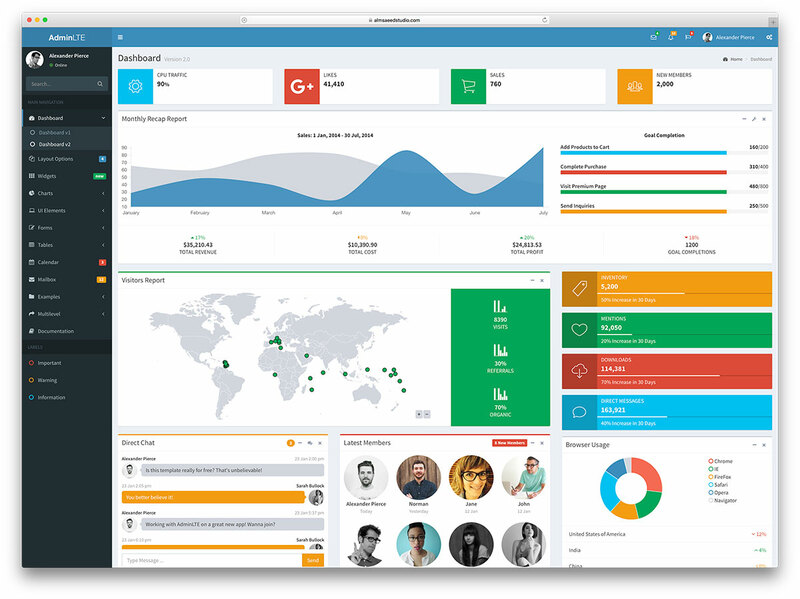 Gentelella is a fantastic tool with which you will easily create stunning admin panels and marvelous back-end dashboards. The free template comes with many features, like charts, validation, off-canvas menu, upload area and progress bars. You might get the feeling like you would be using a premium template, not a free one. Don’t bother, use it to its full potential. 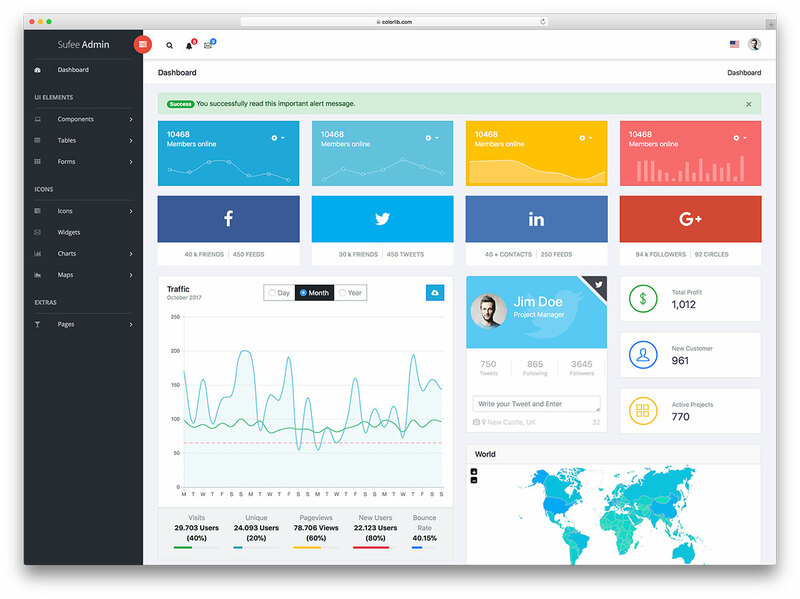 AdminLTE is the most popular free admin dashboard ever released. It has been downloaded several million times and used by developers worldwide. 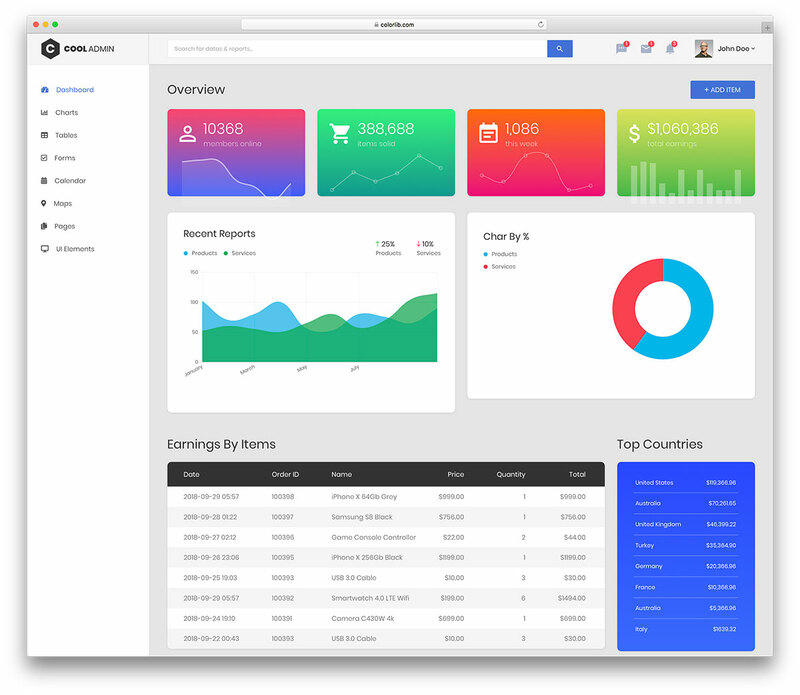 Concept is a free dashboard template like none out there. It comes with many unique features and a wide specter of handy components. It will be a breeze coming up with the must-have admin dashboard section that will take your mobile, web or desktop application to an entirely new degree. The content and material are already predesigned for you, just utilize what is available and launch your project in style. It sure is important to please your end consumer with your project or service, however, to achieve that, a solid dashboard will be of tremendous help. Thanks to Concept, you now do not need to worry about any of the technical parts anymore. Your admin panel is guaranteed to practice all the latest trends and directions for a continuous smooth operation. Do things the right way with Concept. 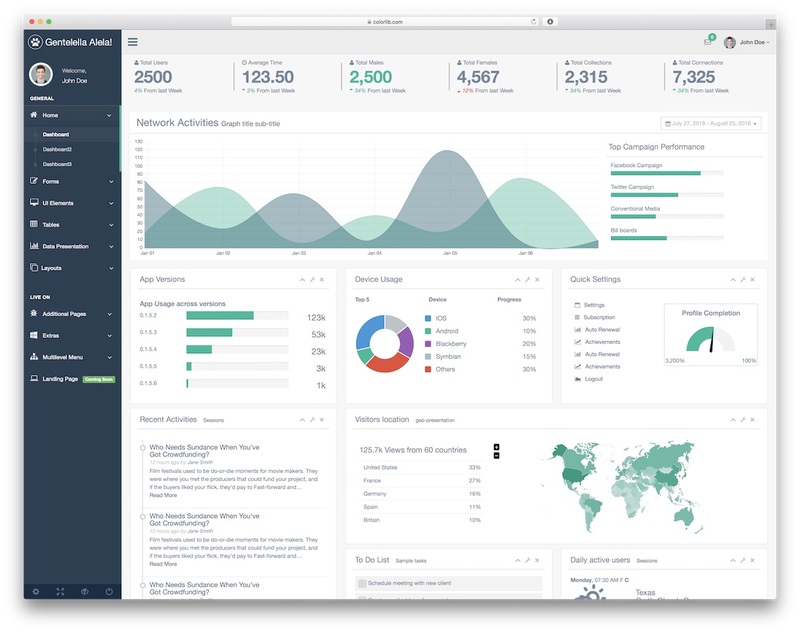 SRTDash is a fine, clean and to the point free dashboard template with three different index pages. One is for ICO, the second for eCommerce and the third for SEO purposes. Pick the one that suits your needs best and begin utilizing all of its amazing features. Bear in mind, if you are working on a different project but you dig SRTDash design through the roof, you can also customize it however you see it fit your needs best. 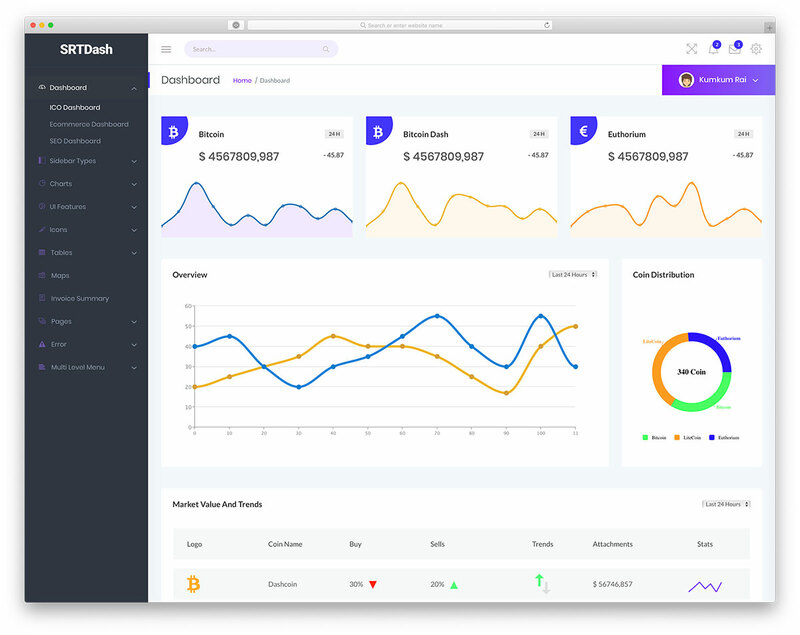 Some of the features of SRTDash are two types of navigation bars (sidebar and horizontal), charts, loads of UI elements and a multi-level menu. It also includes three styles of error pages, login and register forms, as well as lock screen section. Download SRTDash now and start employing it immediately after. 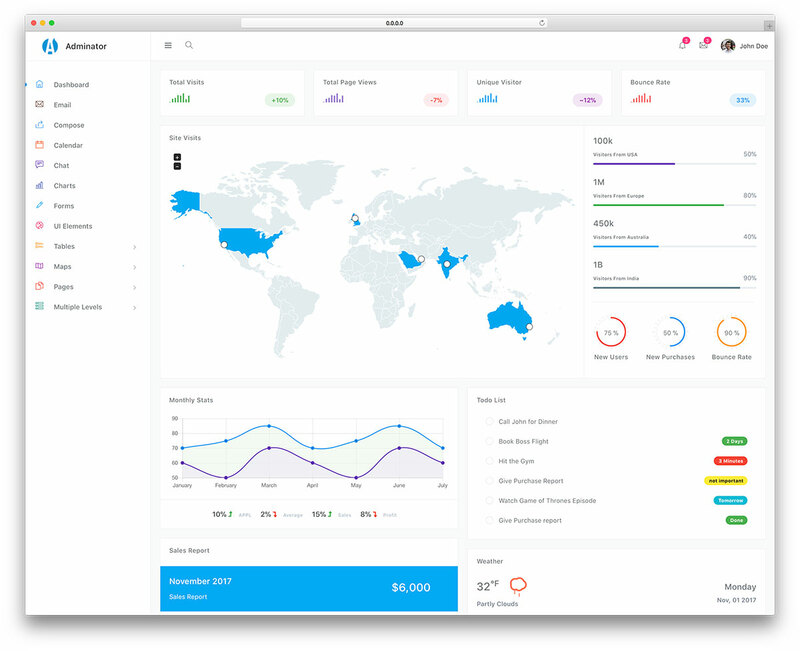 Kiaalap is a Bootstrap Framework powered free dashboard template with all the needed and then some. It practices all the latest technologies, like HTML5, CSS and jQuery to deliver an experience like none out there. To increase the hype, Kiaalap sports three stunning home designs and over fifty pages. You see, Kiaalap is a remarkable tool that is both free and delivers a hell lot of material that will quick start your project with a professional admin. To break the goodies down even further, Kiaalap comes with Google Maps, images cropper, password meter, plot chart and PDF viewer. Needless to say, Kiaalap is also mobile-ready and cross-browser compatible. It will work on all devices and platforms smoothly and fluently for all to get the most out of it. You are short moments away from realizing your thing so waste no more time. 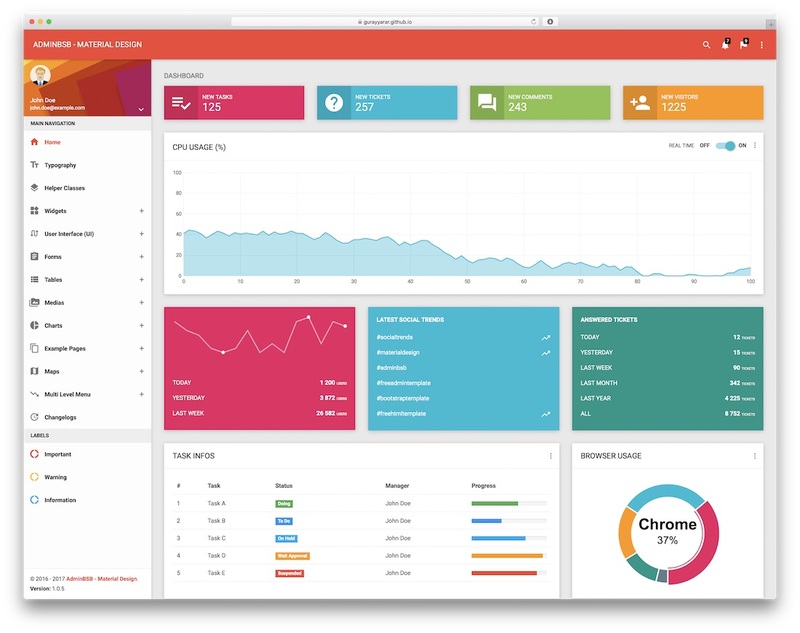 Sufee is yet another free admin dashboard created and maintained by Colorlib. It packs loads of plugins, libraries, elements and page templates that will leave you and your users speechless. Sufee is based on Bootstrap 4. There is no need to mention it but somehow stating it feels right. Well, you will unquestionably enjoy ElaAdmin free template. Either you are a developer or a webmaster who needs to work with a dashboard, here is another fantastic product that you should not miss. ElaAdmin perfectly blends features with design what makes it enjoyable to work with. It comes with many components and plugins but still keeps things light and easy to use. With ElaAdmin, everything is very straightforward. You will not feel overwhelmed although the tool is powerful and rich in features. For an even easier and quicker start, ElaAdmin developers also put together four example pages. Get the tasks done with ElaAdmin template and unlock a new chapter for the project you work on. For a quick start of your admin section, CoolAdmin is the free dashboard template that has you covered with all the needed. In fact, you get even more material in the CoolAdmin package that you will ever need. However, you might be building various online projects and if that is the case, then you win big times with CoolAdmin. Besides, you also do not really need to worry about the technical part since CoolAdmin has thought about all of it already. CoolAdmin follows all the latest and up-to-the-minute tech and web regulations to provide a solid and stable template for whatever application you are bringing into being. Moreover, it comes with four distinct demos, multiple widgets, various custom pages and a wide collection of ready-to-use snippets. Once you download and unbox CoolAdmin package, you will see the first results shortly after. Basically, regardless of which free dashboard template you choose from this collection, your project is safe and secure. All are advanced and optimized to the fullest, including Notika. 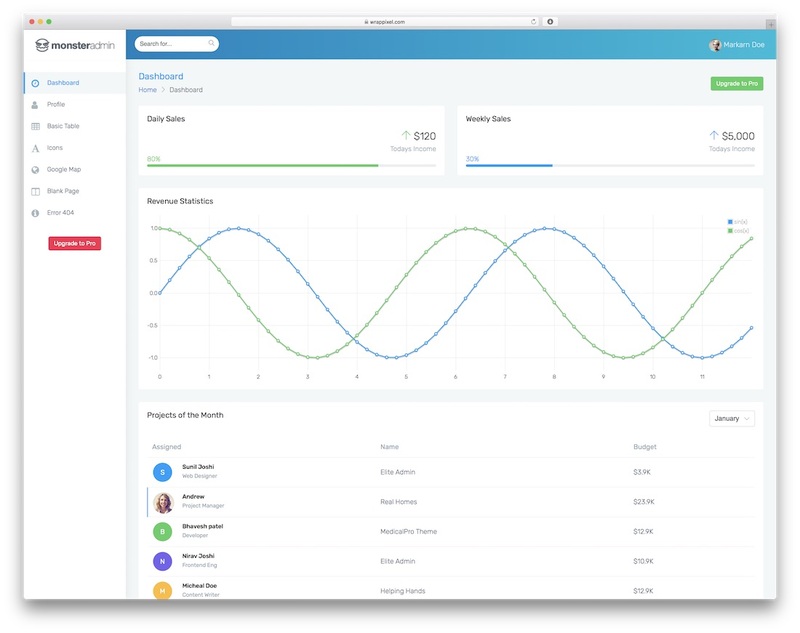 Another terrific instrument which helps you create the must-have admin panel. With Notika, you can do an in-depth inspection of your page or app at any time. By having a better understanding of how your web space is doing, you can optimize and adjust it accordingly. You can always guarantee a better experience and in return witness a steady growth of your product. With three ready-to-use home pages and loads of elements and components, Notika makes sure all segments are sorted out. Along with the index section, there are more than 46 inner pages included in the bundle for you to benefit from all of them. Obviously, we are not all interested in light designs, some prefer dark layouts way more. If that is the case for you, you are in for a treat! 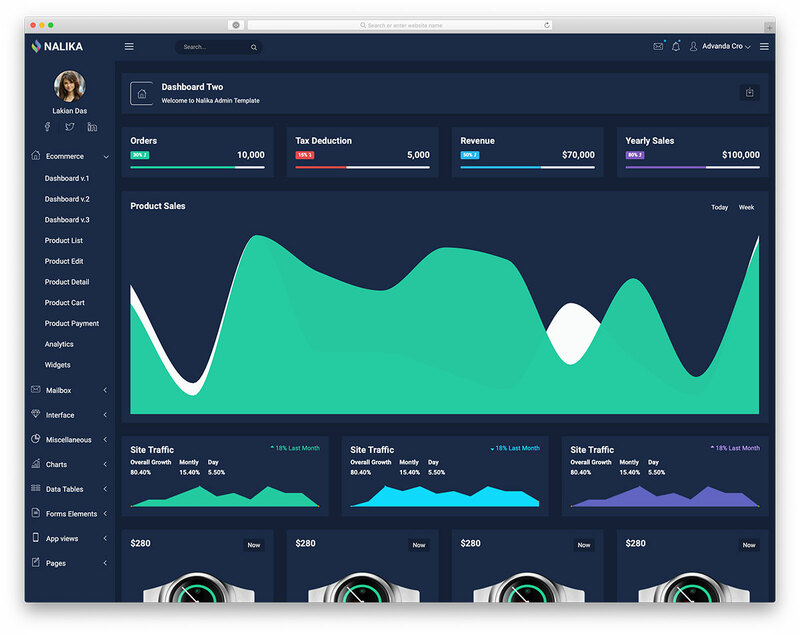 Nalika is a free dashboard template with a dark look that will amaze and impress you in an instant. Make sure you check out its live preview page and examine it in great detail before you jump in with both feet. However, Nalika is free after all so you have nothing to lose. But you are definitely leaving a lot of money on the table if your admin dashboard is features and appearance deficient. Nalika is a fantastic option if you are running an eCommerce website but not limited to. It comes with three different home page styles and all other killer pages, charts, tables, forms and widgets. You just found yourself the best dark admin alternative. Although it is a free dashboard template, AdminPro does not give a sense of being one. In other words, AdminPro, hence the name, is a powerful and professional layout with quite a striking set of elements and characteristics that will blow you away. First and foremost, AdminPro comes with a whopping seven different and unique home designs. More are coming so make sure you check back every so often and see what is cooking. In brief, AdminPro is always up to something and front-end page is what is coming next. After you select the look you prefer the most, you then get to experience all other amenities of AdminPro. It gives you all the necessities you require, making sure nothing is missing. Start your web application strong with AdminPro and have it all organized and clear. You might be running an online jewelry shop or you plan on launching one. In both of the cases, you need to have an admin panel that provides a complete and comprehensive overview of how your store is doing. 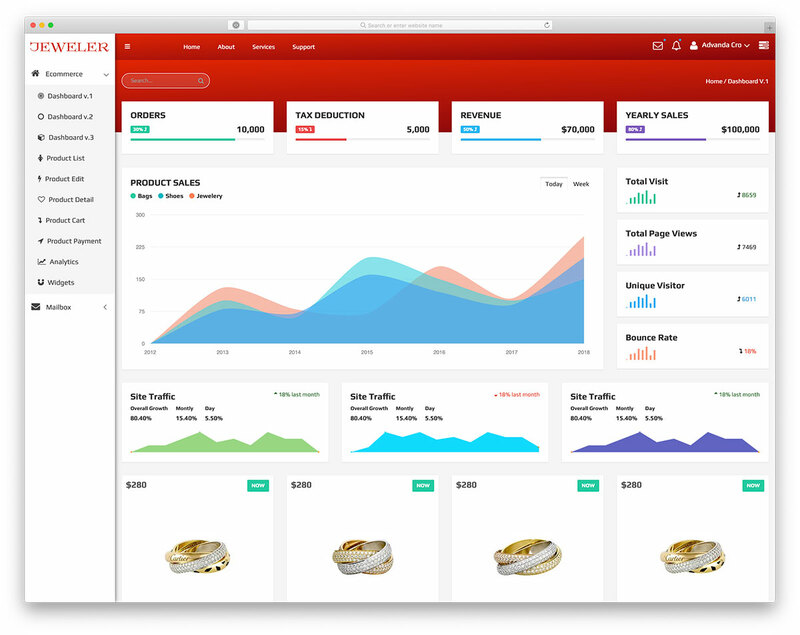 Jeweler is a free dashboard template that does one part of the work for you. It comes with all the elements and layouts predesigned for you. From now on, you can improve and adjust Jeweler to your needs or even use it as is if it is a perfect fit. Right off the bat, Jeweler lets you experience three different homes. A product list, product payments, analytics section and various widgets are also at your service. But this is only a small segment of the features you get with Jeweler. 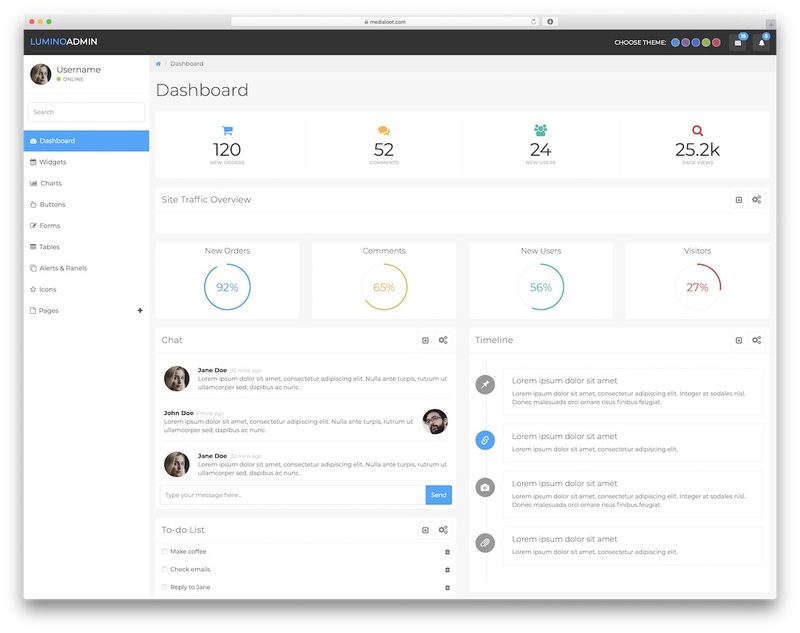 With a proper dashboard, you can scale your business easier and more efficient. Depending on the application you are launching, an admin panel would help you track it accurately. Have control over all the stats and scale accordingly. 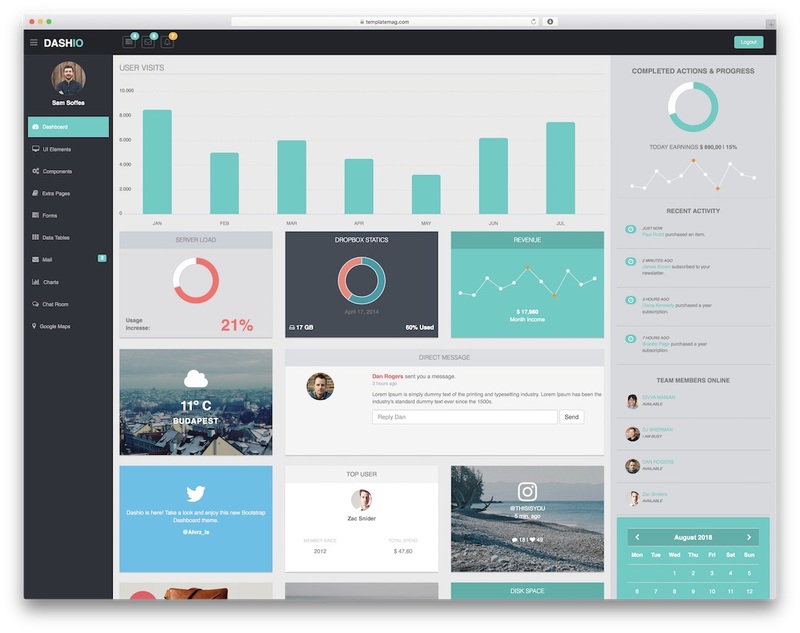 Nice is a free dashboard template that does just that. 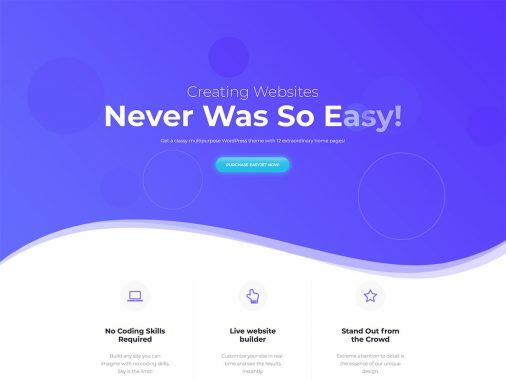 It helps you create a professional and comfortable to use web design for your admin regardless of your app or online project. With its clean and contemporary layout, Nice ensures that you are not submerged in countless data. Bear in mind, Nice Lite is only for personal use and if you would like to use it for commercial use, you will need to step it up to the Pro version. However, to test the waters and get the gist of it, Nice’s free version will do the trick for you. It offers you one dashboard demo, seven additional pages, ten UI components and many other basic elements. 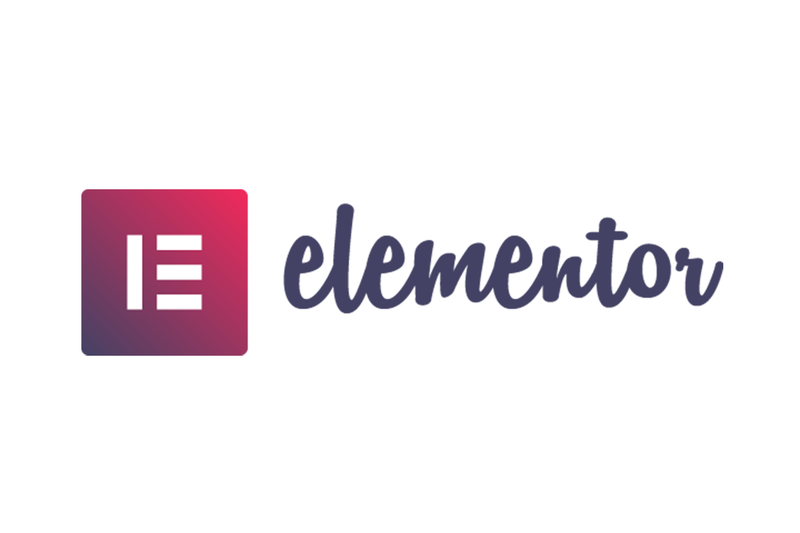 With a name like that, you know you are getting a modern, elegant and sophisticated free dashboard template when choosing Elegant. The tool is based on the powerful and popular Bootstrap Framework which gives it the necessary flexibility and responsiveness. No doubt, Elegant also works seamlessly on modern web browsers, retina screens and ensures fantastic performance. Although Elegant costs you nothing, that does not mean the web design is half-baked. Sure, there are certain limitations when it comes to using Elegant Lite, but you still get more than enough content to build yourself an admin dashboard. From the main page to the several inner sections, many UI elements, tables and Google Maps, it is all in the bundle. Kick things off with the free version and use it for as long as you want. For some, Elegant Lite might be more than enough. Xtreme is a robust free dashboard template with enough ready-to-use material to get you started sooner rather than later. 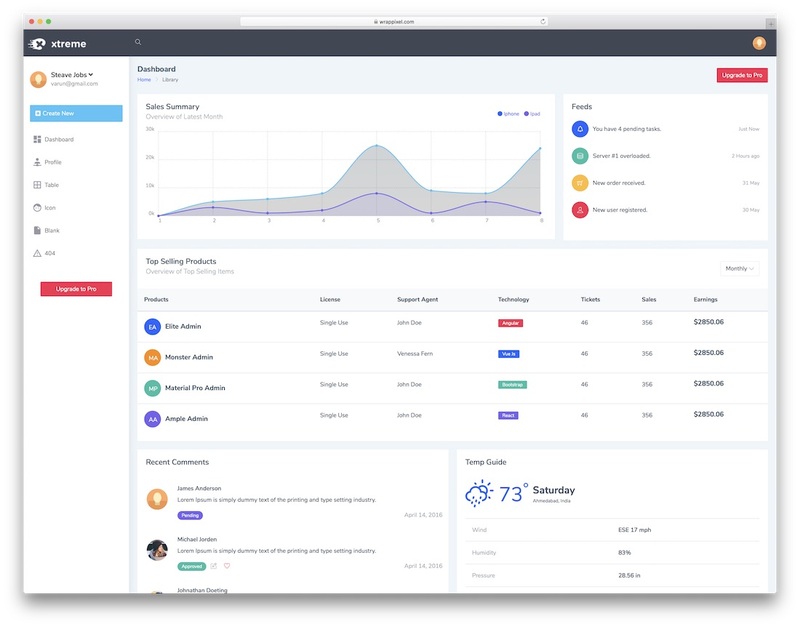 It is a Bootstrap Framework admin tool with one main demo, several page layouts, ten UI elements, ten plugins, a lifetime worth of free updates and two forms. In addition, you will also get a few ready-made widgets, three table examples, over one hundred Font Icons and a couple of charts. Free does not always mean lack of features. Still, even if you start with Xtreme’s free version, you can always upgrade and go Pro later on. However, if you find that the features of the free alternative are enough, by all means, keep it running for years to come. All it takes is a click on the button and you can already start playing around with Xtreme’s features and have a dashboard ready quickly. MaterialPro Lite is a free dashboard template for personal use wich was built using Google Material Design, hence the name. For flexibility, MaterialPro Lite template is powered by Bootstrap 4 Framework so you do not have to bother about responsiveness if the final product. With MaterialPro Lite, you get seven page templates and over ten UI components. The tool includes Font Awesome icons, one-of-a-kind color options along with basic data table. Google Map, error 404 page and profile page are also part of the game. MaterialPro Lite is clean and minimal in design what calls for a distraction-free use. Take the Lite part away and you have a premium plugin which unlocks even more features and commercial use. But do give the free version a shot and see how well it performs for your app. 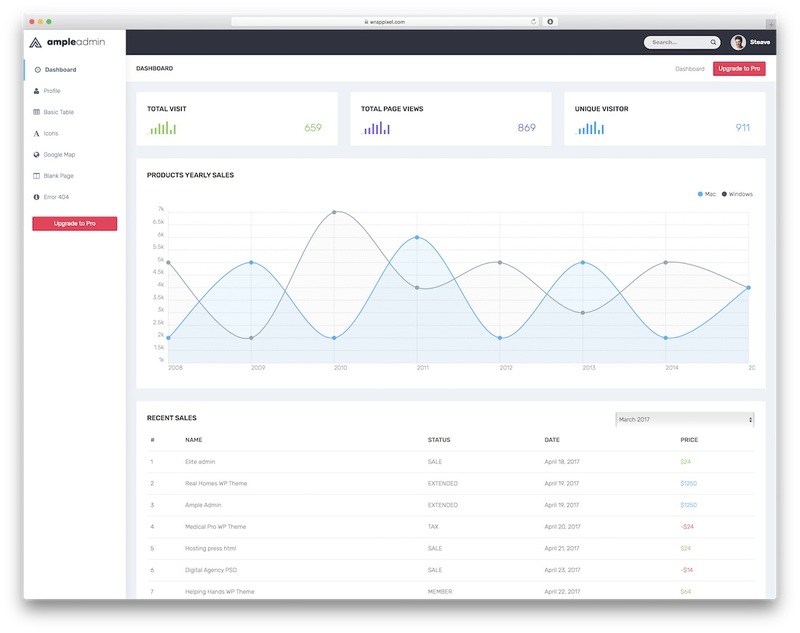 Lumino is an elegant free Bootstrap dashboard template for creating the shiniest admin panels. Very minimal in the design with lots of features for making your life simpler and more productive. You will not have a single issue customizing the template to meet your needs and requirements. For instance, update the Lumino’s main layout color with your preferred one, as well as font, using SASS variables. Some of Lumino’s features are widgets for forms, charts, panels, menus, UI elements and a wide range more. As a great addition, there are also notification features available and user functions. For your information, there is a Bootstrap 4 version of the template available, plus, the pro option. You find all the information on the download page. Get that admin panel look how you fancy. The cleanness and simplicity of Ample Admin Lite free dashboard template will definitely hook you in an instant. 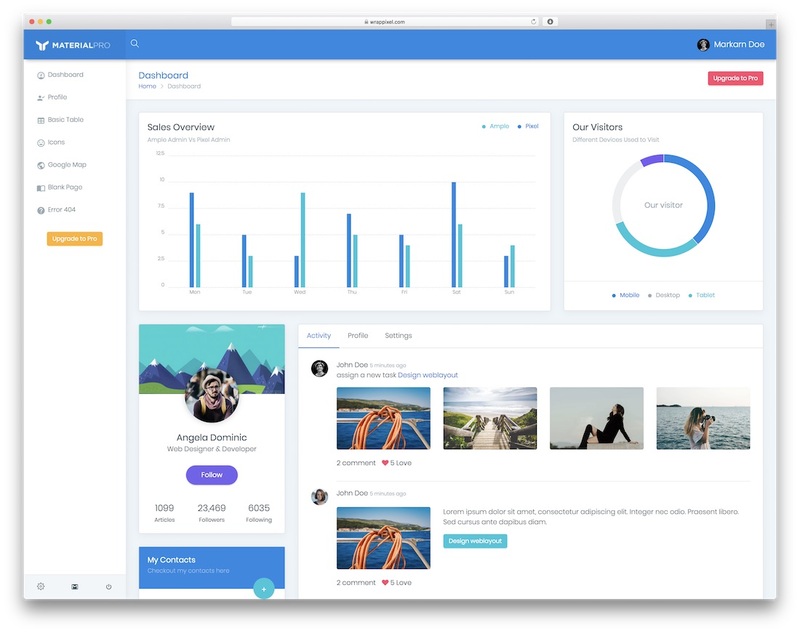 While there might be a ton of stats and other information going on in the admin panel, the last thing you would want is to have a complex design. Sure, it might look pretty but when you start investigating the results, the overdone design might be a distraction. Not with Ample Admin Lite. The main features of Ample Admin Lite are the mentioned minimal look with several page templates and a nice portion of UI components. Bootstrap 3, 100% responsiveness and super simple to modify all come in the bucket of key features. To look Ample Admin Lite in action, make sure you do not miss the live preview. Tables, icons, Google Map integration, error 404 page and profile page all come part of the free template. 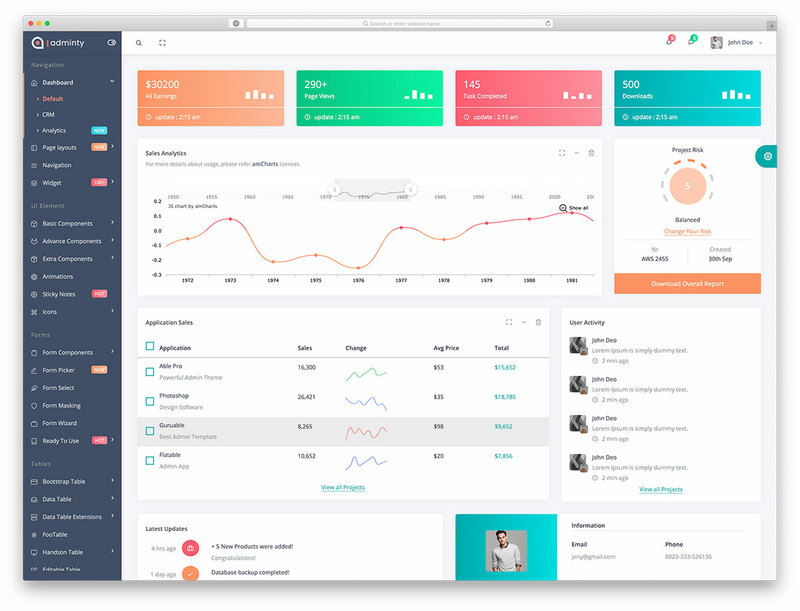 AdminPro Lite is an entirely free dashboard template which you can use for all kinds of personal projects. It uses modular design with an off-canvas menu but most importantly, it is clean and fairly basic. Kinda like an admin panel should be. Clean, stylish and straightforward. All this is what you will find in AdminPro Lite, plus an entire stack of awesome features that will enhance your workflow. Customize its color and fonts and put all the extras to use for achieving goals faster. There are seven page templates at your service for profiles, tables, maps and more. Google Map is integrated into AdminPro Lite along with a ton of material icons and even a 404 error page. Indeed, the layout is mobile-friendly so any device user can enjoy it. Are you ready to bring the administrator to the next level? Monster Admin Lite is not at all frightening rather appealing to the eye and very user-friendly. 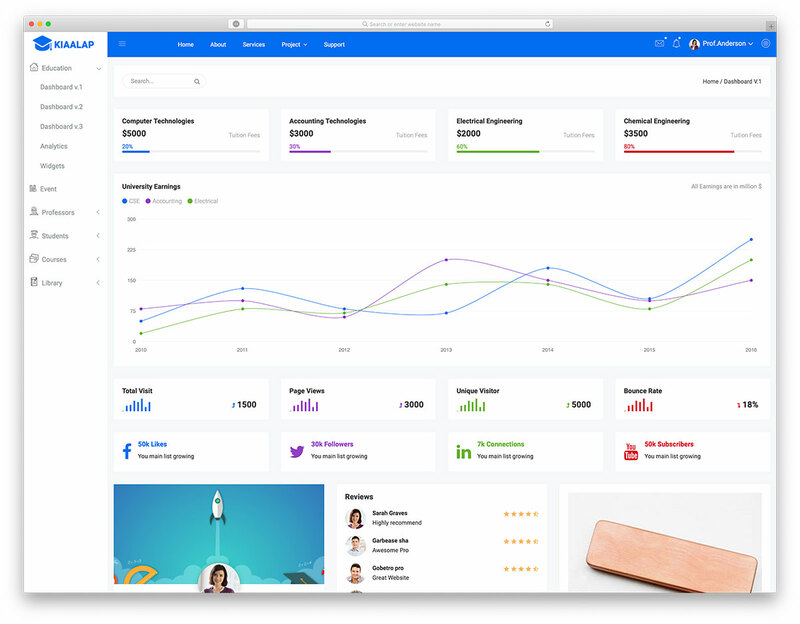 It is another fantastic, neat and refreshing free dashboard admin template which you can use for your personal online projects. When you would like to step up the game, upgrade to the pro version which you can use freely for commercial sites and apps. But test the waters first and see if it is a fit for what you need. No doubt! Monster Admin Lite template is based on Bootstrap 3 for complete flexibility of its layout. In other words, you are able to operate it from smartphones, tablets and desktops smoothly and effortlessly. Ten UI components, seven pages including 404 and Google Map and a special section for profiles. Even if it is not seen to the end user, it does not mean it should not be beautiful and practical. Neat and all shipshape, that is what we could roughly say Pixel Admin Lite template is all about. If you need to construct an admin that gives you an overview of your website and application’s performance, Pixel Admin Lite is a great way to go. Set tasks for specific profiles, see the number of sales you generated on a daily basis and read the current messages. But that is just a tiny fracture what you can do with Pixel Admin Lite template. Create tables and profiles for each contributor or team member and have it all organized to the T. Your admin can also be your secret, back-end office that no one knows about only you and your members. Use it to march towards new goals and assign different tasks to each of your colleagues. 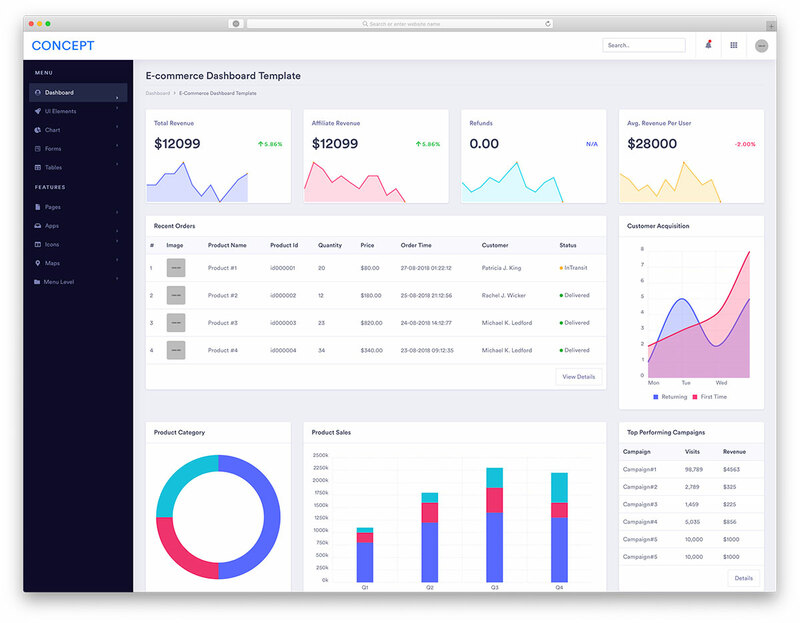 If you are in need of a responsive Bootstrap 4 webapp UI starter, SB Admin 2 is the free dashboard template you should look into. It is an HTML template with a variety of features to meet many users’ needs and requirements. The template comes with a multi-level menu for creating numerous dropdowns and active classes. Both sidebar and top menus are responsive with a set of cool features for you to have better access to different sectors of your admin panel. SB Admin 2 is browser compatible and follows all the latest web technologies. It comes with three custom panel styles, searchable tables and LESS files for customization. There is also a chat widget and a login page by Bootsnipp. Make it follow your rules and modify SB Admin 2 template exactly how you want it to look. It allows you to do just that. Hence the name, Dashboard is ideal starter template to bring into being an admin, control panel or, like the name says it, dashboard. It is a Bootstrap 3 template what makes it fluent and flexible to work and adapt to all devices instantly. If you need a quick solution for a lit back-end, Dashboard template should be on your to-check list. Or do it right away by hitting the preview button and see Dashboard live. 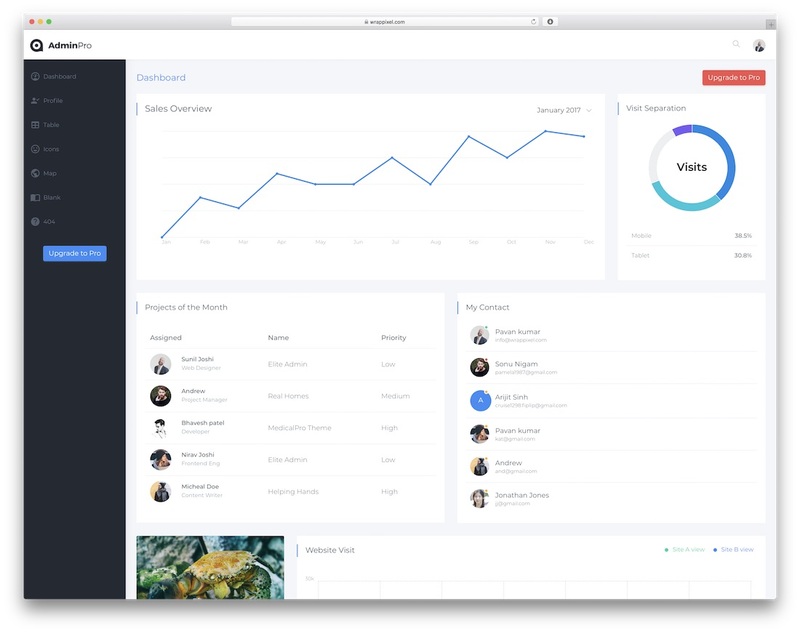 Dashboard template can be a great starting point for building something original. Make adjustments so it follows your project and gives you a quick checkup of how it is performing. 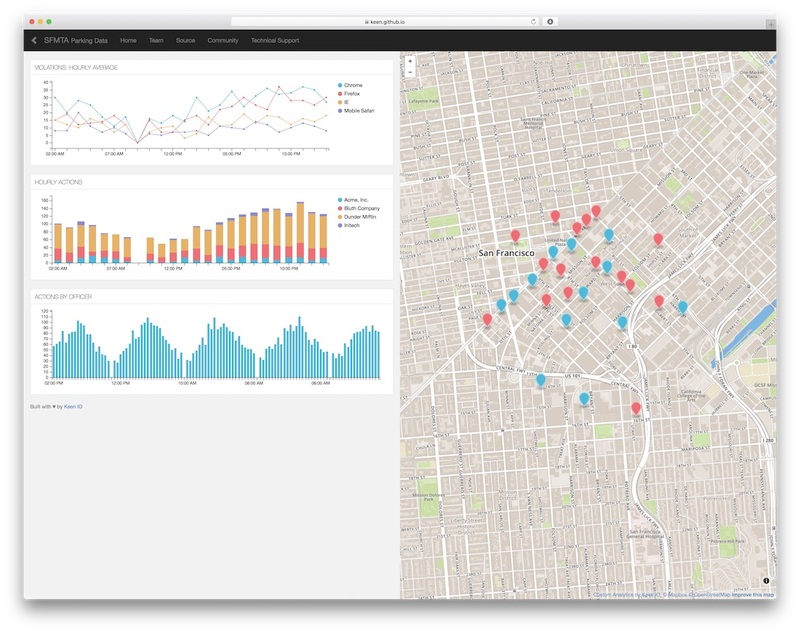 It all happens in the beautiful back-end that you will develop with help from Dashboard. Do not feel limited and start performing tweaks and the dashboard will help you boost your business. Are you in need of a proper analytics dashboard which shows you all the data you need whether you work on your own projects or your clients’? 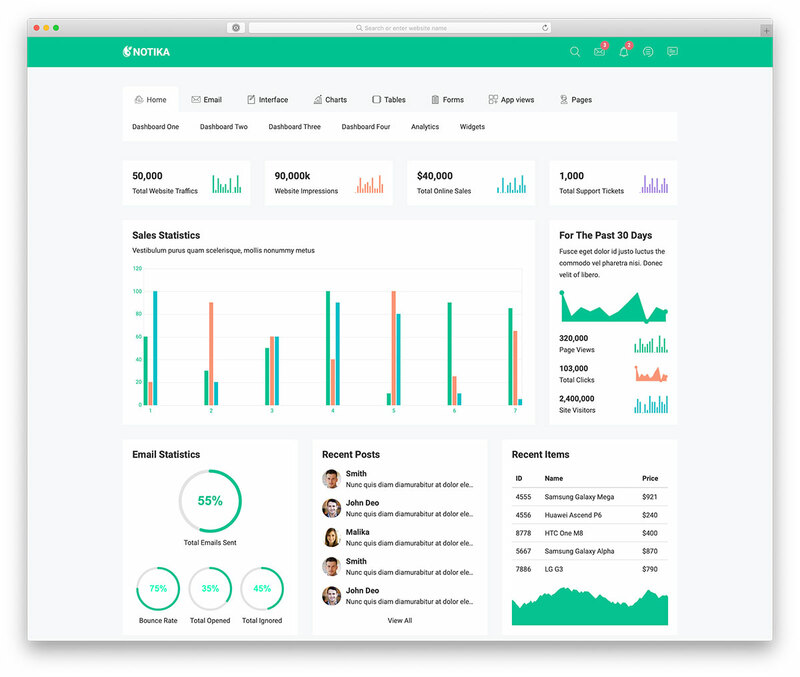 Dashboards by Keen IO is the free product which you can use to share the statistics with your team members or customers. There is no need to build from scratch and modify CSS. Moreover, you do not even have to test for responsiveness. 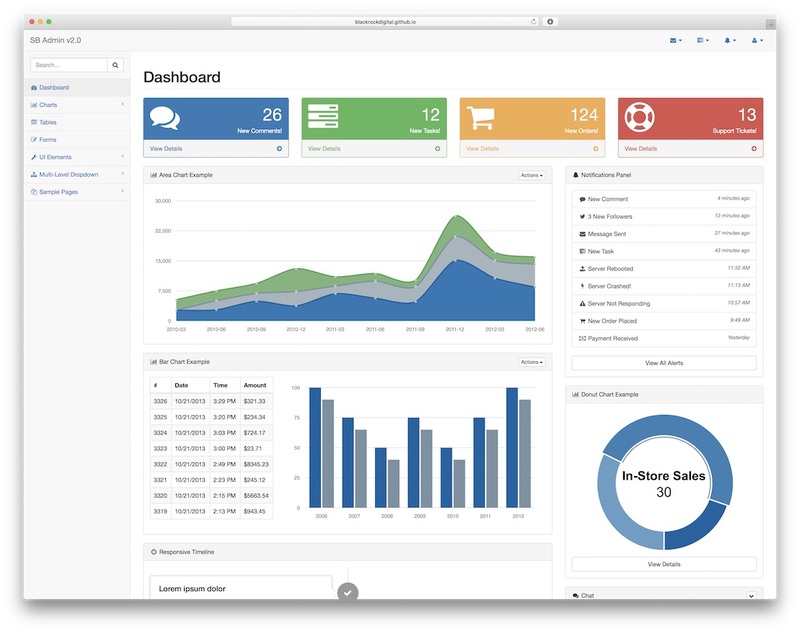 Dashboards by Keen IO guarantees you mobile friendliness and fully functional dashboard. Gather all the data to later optimize the project you work on to achieve the goals faster. Moreover, go beyond the initial business plan in half of the time. You need to invest little work and effort and have a working analytics dashboard ready to collect data. 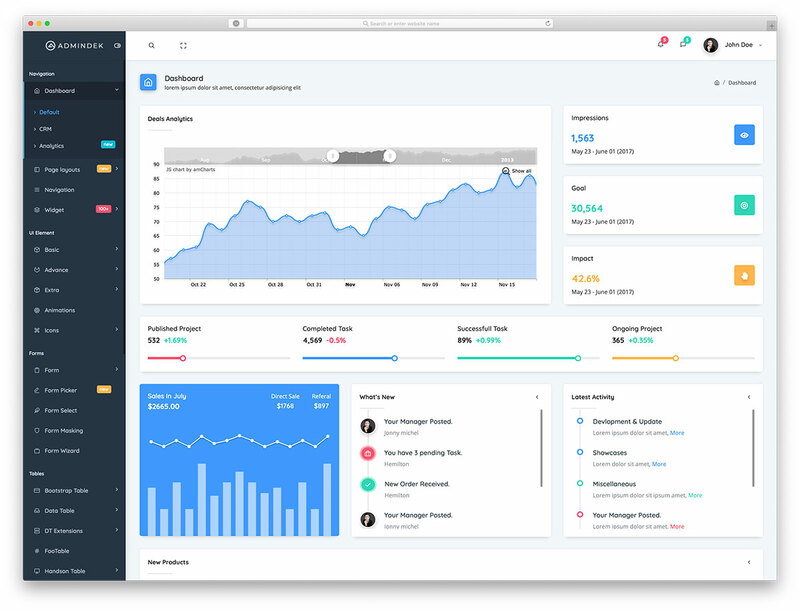 Starting your dashboard will happen in a snap with DashGum free template and its fifteen different pages. Yes, that is not a typo, 15. You will find charts, calendars, notifications, tables, to-do lists, lock screen and more. Cool animations and hover effects spice things up and get a bit of an action going on inside your admin panel. If you are not into this kind of stuff, we have many free dashboard templates appropriate for you in this collection. From those as basic as possible to more complex and colorful ones. There is something for every taste. When you build the desired dashboard with DashGum, you can use it to track how many new files have been uploaded, unread messages, pending tasks and more. One thing is for sure, you will have it all organized in one eye-friendly place. AdminBSB is a free tool with a distinct design what makes it very fun to work with. It is colorful and very engaging but most importantly, easy to work with. 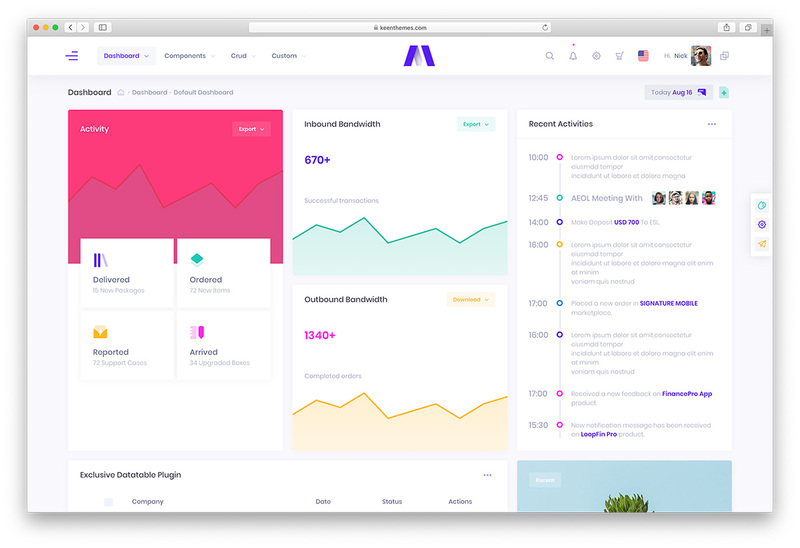 Powered by Bootstrap 3 Framework and Google Material Design, AdminBSB is built to perfection with all the needed elements to get the most out of it. And using it on any handheld device is possible, too, since it smoothly adapts to the resolution of choice. Real time statistics, widgets, image gallery, maps, various charts and a multi-level menu are all features that come with AdminBSB. The free admin panel template is cross-browser compatible and available for both personal and commercial use. Attribution link is also not required but appreciated. See the live preview and be amazed by what AdminBSB is capable of. 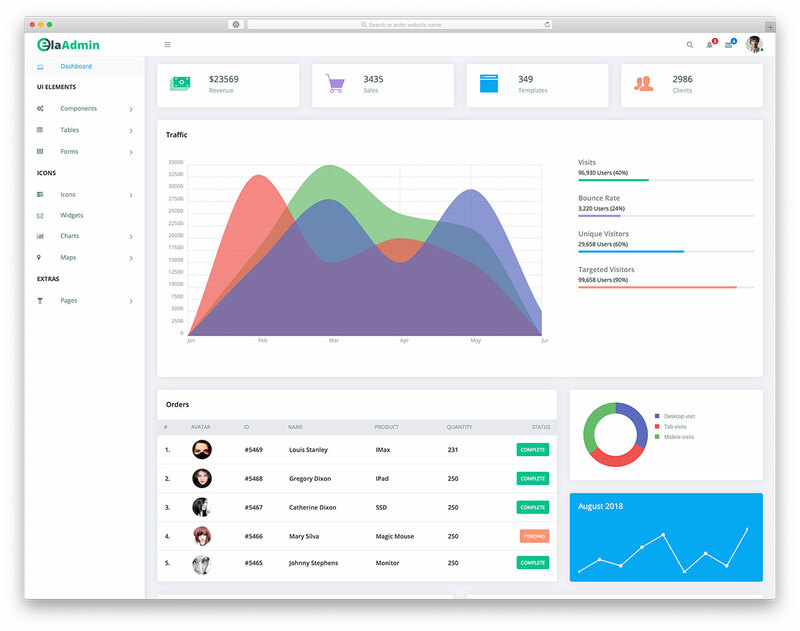 1-We want to develop and sell a project using ElaAdmin theme. Any problems? 2-We can not download ElaAdmin. Can you help me with this? Can you guys inform me when Admindek is available for download? Really like that one! We have no exact ETA. Meanwhile you might want to check other similar admin dashboards. Its a real shame Admindek is not available as a plain HTML template seeing as the demo is already there and pretty expansive in what it includes. I’m really interested in using it but have to wait for this arbitrary “enough interest” goal when theres no way to actually register your interest in it.